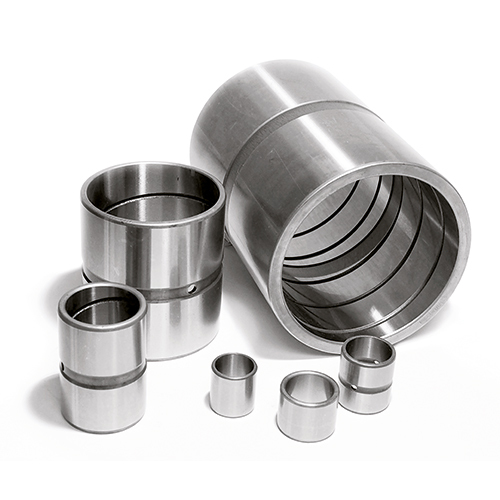 Sibo’s STD Line is a line of standard bushings with SIBO tolerances (Ø Outside u6 – Ø Inside C8) that undergo casehardening and tempering treatment with casehardening depth of 0.8-1 mm and Hardness HRC 58-62.
the friction factor and consequently makes the bush more efficient. The use of these bushes, after an initial greasing cycle, enables a lubrication interval of up to 550 h. max. (the interval varies based on the working conditions). The STD line consists of a standard range of types (see page at side), which are able to enhance and meet the customers‘ requirements to the full; furthermore in most cases (the most popularly sold types and dimensions), they are available from stock. Sibo can also manufacture other types of bushes (see special bushes) on request and according to the customers’ drawings. Each bush is traceable and identifiable thanks to the indelible marking on each piece, which identifies the lot. Superficial needed treatments, different heated cicles or special marks are made on customer request.